With just a few simple ingredients, you’ll be on your way to making bakery-style Italian Butter Cookies! 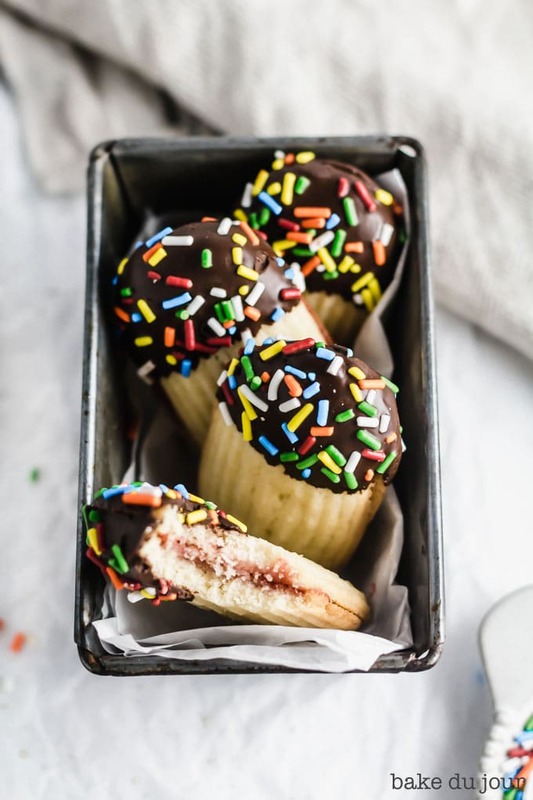 For a real treat, you can make jam sandwich cookies out of them and dip them in chocolate! Have you ever experienced your taste buds changing? Like, one day you’re a stalwart chocolate ice cream fan, but the next… you’re ALL about vanilla? This happened to me a few years ago and I’m thrilled to announce that I’ve been struck by this phenomenon once again. 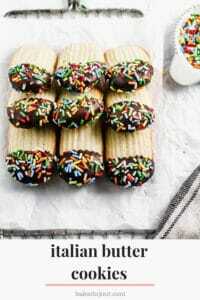 Hence, these Italian Butter Cookies coming into the picture. But first, a little exposition! Growing up in Brooklyn, I was (and still am) basically surrounded by Italian bakeries. 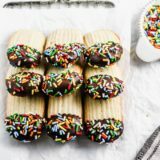 With rows upon rows of cookies and cannoli shells on hand, it’s safe to say that these bakeries are staples of good ol’ Brooklyn. Unfortunately, I was never really a fan of their cookies; to me, a lot of them seemed to have a very distinct almond flavor that I just wasn’t into. And to add insult to injury, it seemed like no holiday gathering was complete without a massive pile of these cookies, all wrapped up and ready to eat. Well, all of this has changed and WOOF. I can’t tell you how dangerous this is for my diet. When we celebrated Christmas with my mom and her boyfriend last year (can’t believe I am referring to 2017 as “last year”), this bundle of cookies inevitably made its way to the table and I decided to give the jam sandwich cookies allllll the way at the bottom a try. Next thing you know, I’m five cookies heavier and I’ve got a few more stashed away in my bag to eat at home. Once the leftovers were gone, I decided to find a way to make them at home, so here we are! 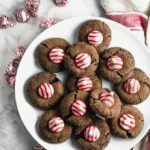 This recipe is a bit similar to my recipe for my Holiday Spritz Cookies, and the execution is just as simple. I used a large star piping tip to pipe these cookies out, but you can use a cookie press if you like or a piping tip of your choice. The world is your oyster! If you’re looking to get the same shape I did, you can just pipe out 2 inches of dough, lengthwise (I used my Wilton 8B tip here). The dough doesn’t have thaaaat much give, so you’ll have to muster up a bit muscle to pipe these out. Tis truly a labor of love. Once you’ve got ’em all piped out, pop them into the oven for 15 minutes until the edges are a light golden brown. The fun part comes next! I *really* like the way these cookies taste with a bit of jam sandwiched in between them so I bought a jar of raspberry jam for this very purpose. From there, I went for the whole shebang and dipped the sandwiches in melted chocolate, followed by a healthy dose of sprinkles. After the first successful batch, it was like I couldn’t bake them fast enough! These cookies are the real deal, you guys. 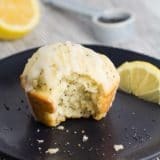 I hope you give them a shot; the recipe is so easy that you’ll save yourself a trip (or five, in my case) to the bakery! If you make these, let me know by leaving a comment and rating the recipe – I’d love to hear from you! 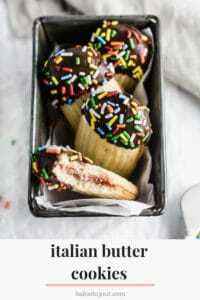 With just a few simple ingredients, you’ll be able to make these bakery-style Italian Butter Cookies right at home. And for a real treat, you can make jam sandwiches out of them and dip them in chocolate! In a large bowl, beat the butter and sugar together using a hand or stand mixer at medium speed until fluffy, about 2-3 minutes. Add the egg and vanilla extract (and almond extract, if using) and mix until it’s just incorporated. Slowly add the flour to the mixture and mix until a dough forms. Transfer the dough to a bowl and cover it with plastic wrap. Refrigerate for at least 30 minutes. Alternatively, you can pipe out the dough first and stick your baking sheets in the refrigerator! When you’re ready to bake the cookies, preheat oven to 350F and line 2 large baking sheets with parchment paper or a silicon baking mat. Fit a pastry bag with the piping tip of your choice and fill the bag with the dough. If you’re using a cookie press, make sure to follow the manufacturer’s directions. Pipe the dough into 2-inch long segments, spacing each segment about an inch apart. 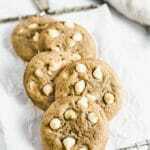 Bake the cookies for 13-15 minutes, or until they are light golden brown on the edges. Cool the cookies on the sheet for 5 minutes before transferring them to a cooling rack to cool completely. Place your chocolate chips/chocolate into a microwaveable bowl and microwave it for 30 seconds at a time, making sure to stir the chocolate after each time. Once the chocolate is about 75% melted, remove the bowl from the microwave and stir the chocolate the rest of the way. The residual heat will do all of the legwork for you! *If using, you’ll also want to pour your sprinkles out into a shallow bowl at this time. Once the cookies have cooled, flip half of them over as they will be the bottom half of your cookie sandwiches. 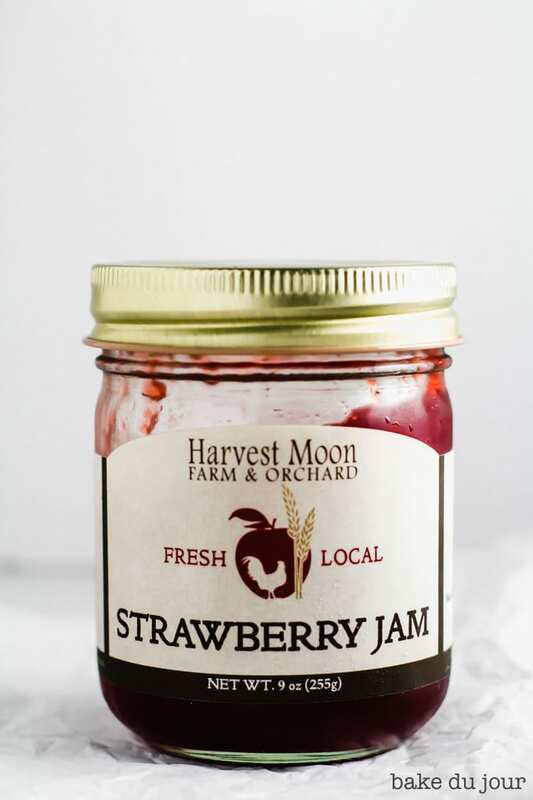 Pipe or spoon 1/4 teaspoon of preserves onto each half and sandwich them with the top halves. Dip the sandwiched cookies about 1/3 of the way into the melted chocolate, taking care to let the excess chocolate drip off. Drizzle the sprinkles over the chocolate and return the cookies to the baking sheet so they can set. You can also pop them into the fridge for about 5-10 minutes! 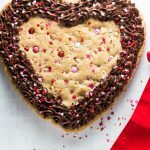 You can freeze the cookie dough if you like—just make sure to let it thaw overnight before baking. Cookies will remain fresh in an airtight container for a week. Isn’t 1/2 cup of butter actually 2 sticks of butter (16 tablespoons) (at least in US measurements)? These sounds yummy! These cookies are so pretty! 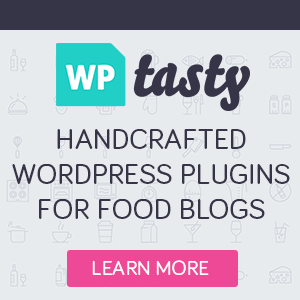 I saw them on foodgawker and just had to check out your blog! 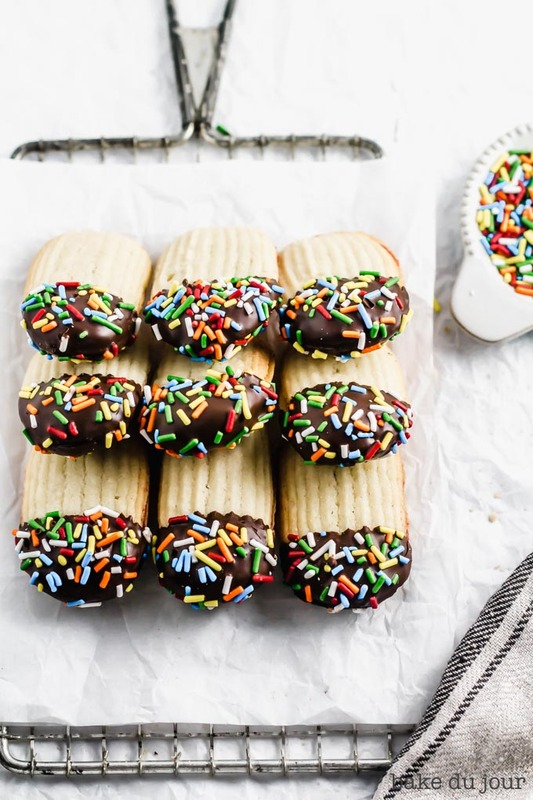 I’d love to make these as soon as possible, with all those colorful sprinkles. Pretty fun, Pretty pictures, & Pretty tasty! Love these cookies! Reminds me of the ones my grandma would bring for Christmas dinner from her favorite bakery! They didn’t use almond extract but I love that you did! Recipe saved! These cookies look delicious! I really love the decoration of the melted chocolate and sprinkles! It makes them perfect for birthdays as well. These would definitely make for a great birthday treat. Thanks, Natalie! They’re my new guilty pleasure, I can’t get enough of them! Just finished making these cookies for a birthday party tomorrow. They were very easy to make, and, of course, I had to sample one before putting them out. Delicious. I will definitely make these again. Can I make these & fill the next day with the jelly? Hey, I’ve made these a few times now, and I absolutely love them! I have been struggling to get good definition from my piping though, the lines always seem to melt away in the oven. Do you have any suggestions on how to prevent that? I’ve tried using a few star tips, all with the same result. So glad to hear you’ve been enjoying them! As for the lines melting away, try placing the baking sheet + the piped dough in the refrigerator for 30 mins – an hour to see if that helps! Can you roll the dough and cut them? The dough (even refrigerated) is too soft to be rolled/cut, so I’d recommend piping! 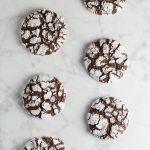 Can you freeze these cookies (before the last step of adding the chocolate)? 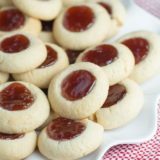 How long do these cookies last after made? Hi Alyssa! Yep, you can freeze the dough if you’d like. Just make sure to let it thaw overnight before baking. And they should keep for about a week in an airtight container. 🙂 Hope that helps! These look amazing! 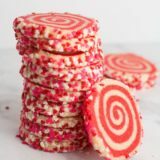 What kind of piping tip (number/style) would you recommend using for these cookies? Thanks, Victoria! 😀 I used a Wilton 8B tip (there’s a link to it in the post), but you can opt to use a smaller tip if you want skinnier cookies. Happy baking! 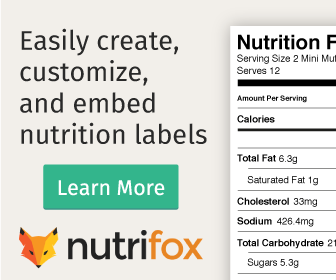 Can powdered sugar be substituted for the granulated sugar? I haven’t tried this before, but you may have to double the amount of powdered sugar (so you’d be using 1 cup powdered in lieu of 1/2 cup granulated). Let me know how that goes if you try it! Ann: thank you for your quick response if you think that may work I will give it a try and let you know. How do you go about freezing this dough? Would you pipe it out then freeze it? I made your cookies today but my dough seemed so stiff. I could barely pipe it out. I had to remove the tip and just use the pastry bag. I measured the ingredients carefully. They were delicious but not sure what I did wrong. So sorry to hear that, Mary Helen! Did you refrigerate or freeze the dough before piping? If so, I’d definitely recommend giving the dough time to thaw out beforehand. Also, make sure the egg and butter are both at room temperature! I decided to pipe them before I put in the fridge. Perhaps the butter and egg could have been a bit warmer but after all the work with it I was surprised that it would be an issue. I did make a double batch, could that have been an issue? I had done it with other recipes so disn’t think it would matter. I made these the other day at a cookie baking party. They were a hit! Now I’m making them for dessert for a holiday dinner at my in-laws. However, I was rushing and threw the dough in the freezer instead of the refrigerator accidentally for over an hour… How can I thaw this quickly so I can use it today? Maybe in a warm water bath? Glad to hear they were a hit! 😀 You can definitely try a warm water bath – it’s not something I’ve done before, but I love the idea! Some other workarounds include breaking up the dough into smaller pieces and placing the dough near a warm stove. I hope that helps!